There has been a rematch! After complaints that an old version of MacJournal was used, I have reviewed these two apps again. Click here to see the new review. I have finally caved to HitTail’s requests and now I am launching a new feature: Software Sumo! Software Sumo will evaluate two Mac softwares (often freeware…in which case I guess it would be Freeware Fencing). Today we will be kicking off with MacJournal vs. Journler. Soon I hope to evaluate NetNewsWire (Lite) and Vienna. Any other requests you have for match-ups can be emailed to me. And now your regularly scheduled programming…. 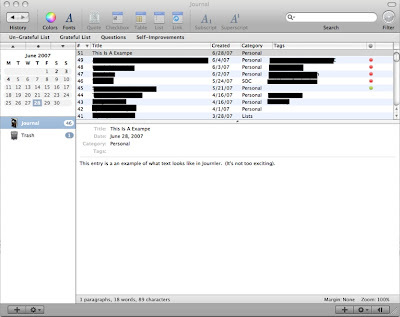 As the names imply MacJournal and Journler are both journaling applications. For the purposes of fair evaluation I have chosen to match up the latest free version of MacJournal (2.6) against Journler. Journler has a nice unified look going while MacJournal has a split aqua thing going on (however, in the most recent, fairly pricey version they have moved on to unified). The buttons are fairly similar but I prefer the ones in Journler. Here we see a three pane, Mail-style layout. On the side we see the Journals (as well as a nifty calendar), on the top pane we see entries (with plenty of information about them) and on the bottom we have the text. The text pane allows for a title and the body text as well as tags, a category and the date. There is also a handy word count ribbon at the bottom of the window. I certainly prefer the interface of Journler because it is more compact without drawers hanging out all over the place, it provides more data and it just looks better (if not perfectly integrated with the OS’s interface). MacJournal: 5/10 – Looks like it stepped out of Jaguar or Panther. Journler: 8/10 – Doesn’t look completely at home among other windows but fairly nice looking. Both applications have rich text entry and picture capabilities as well as journal locking and statistics and blogging (which we’ll look at in the next section). In addition to these Journler has labels (arrived in a later version of MacJournal) and better media integration. I personally never use the media features but I’m sure people will find them handy. In my opinion, as long as the application has basic text and organization features it can pass as a decent journaling application (or at least an improvement from using MS Word). MacJournal: 7/10 – Has the basic features but not much else. Journler: 9/10 – The only feature I wish it had is new Blogger support. 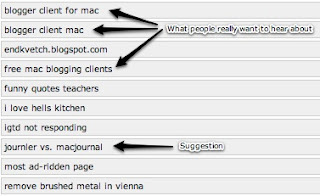 MacJournal has full support for LiveJournal and Blogger, Journler has support for most every blogging service. Journler clearly says that it does not yet support the new Blogger, MacJournal does not address the issue but I assume that is the case because it would not configure correctly (this is a problem I have had with all blogging clients besides MarsEdit and Flock). Obviously I cannot try out the blogging features (at least not until they get new Blogger support). Overall, Journler has scored better with 17/20 as opposed to MacJournal’s 12/20. This certainly reflects my experiences, anyone else who has used these apps want to chime in? As you can see, at the moment applications are only being evaluated based on two main points, if you have more suggestions please email them in. HitTail has finally given me a suggestion (right on que cue). It has suggested that I write on the topic of “Journler vs. MacJournal”. Unfortunately I has no experience with MacJournal (I gave up when it proved difficult to download). I’m not even sure why it picked that keyword, there are three pertaining to a Mac (free) blogging client but only one referring to Journaling apps. I suppose this is the point where I could put my faith in computer aside and use my own common sense to see that people want to hear about blogging clients but my experience is a little limited there too (but if the nice people at Red Sweater want to give me a free copy of MarsEdit I would be more than happy to write up a nice review1). 1 Yes, my love can be bought. Okay, I’m doing consolidations again because I suddenly have a lot to say (no thanks to HitTail, which has not given any suggestions yet). I’m pretty sure the BBC’s readership is lower-brow than they would like to think. In February this story broke and was, predictably their top read. However, just today it spent some time as the #1 read story (edging out this very popular one). The BBC aught to give up on real news altogether. I’m sure the Brits had a good laugh about this story, in which a Texas mob killed middle-aged man, typically American, eh? Lately I have been having kind of strange dreams. For instance the other night I dreamed that cigarettes had been banned…and I chose that time to start smoking. After three days I realized how silly it was and I went cold turkey…which turned out to be really easy. I just realized that my last four blog titles have at least one ellipsis in them (I also just realized that the Blogger widget doesn’t have spell check, so I’m sure I’m spelling ellipsis/ellipses wrong. Of course I’ll spellcheck it before you get to see it but just trust me, I can’t spell ellipsis).